We took ourselves up to Higashiiya on Thursday night, to Nate’s house. 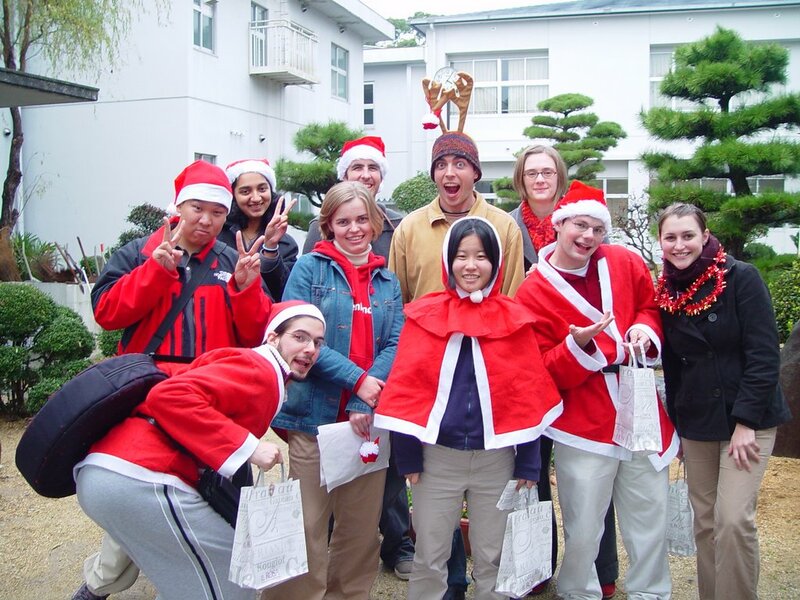 On Friday, we were going on our annual Miyoshi-gun Junior High School Christmas Carol Tour, starting as ever with the furthest-flung school (H.Iya). Thursday night, however, was a night for relaxing and catching up with some people that I haven’t seen for a long time. On Friday, we were up not-so-bright, but very early, and after an excellent breakfast of eggs with peppers and onion, and Danish toast (Nate’s a wonderful host), we were on our way, decked out variously in reindeer antlers, Santa suits and ‘capelets’, and tinsel. My tinsel lasted til the third school, Yamashiro, before some girls decided it was the coolest thing ever, and relieved me of it. Oh well! It was a cold day, and just before our lunch stop, the heavens opened. After lunch, we went to a school in nearby Hashikura, which is for kids with physical and mental disabilities. It was the first time ALTs had gone there to sing carols, and I’m really glad we did. The kids seemed to really enjoy the spectacle, and I think the teachers were happy we’d gone too. Not long after, it was the Miyoshi kids’ turn for some fun. Everyone probably thinks that their own students were the genkiest and cutest, and most charming, but I am proud to say that my ones were for sure up there in the top two or three schools for welcoming us, and getting right into the mood. In my opinion. But I think lots of people would agree with me! I was worried, because we were told to sing inside as a result of the rain, and I thought it might dull the mood. The whole school came down to the assembly area, and we got up on the wee podium in front. Lots of my 3rd grade girls were shouting for me, and waving at me. I shouted good afternoon, and then asked That Question: “How are you doing today?”, and the ENTIRE SCHOOL, all 250 or so students, yelled back “I’M FINE THANK YOU, AND YOU?” . All at the same time, perfect unison. It was a beautiful moment, and all I could do was just grin madly and stick my thumbs up at them (cheesy!). My babies. We then proceeded to rock the house, and the best part was when a rendition of ‘Deck the Halls’ turned into ‘1000 Miles’ by The Proclaimers. We sang the ‘last’ song, and started to leave. Then the first whispers of ‘encor-u’ (encore in Katakana English) began. I pretended to not here them, and cupped my hand to my ear in an effort to better understand them. Soon the entire student body was screaming “ENCOR-U!”, and I finally said “Oh, right, I get it!”. And we went again. Before we headed off to the next school, my lovely Kocho-sensei showed us into his office where we were served hot chocolate and crisps, and then we were off. I love my students! It was the best atmosphere we’ve ever had at Miyoshi, and I needn’t have worried about a dull mood! After we had finished the tour, we were all done in, but I was in an ‘all back to mine’ sort of mood, so that is indeed what we did. Had a good game of poker, ate some yummy pizza, and huddled under my kotatsu. I was pretty tired, however, and felt fairly snappy, which I felt bad about. On Sunday I went to sit a Japanese test. But the less said about that the better. The me and Joe and Lindsay came back to mine, swathed ourselves in blankets, watched the excellent 'Labyrinth' and ate (more) pizza. And it snowed, so it was COLD. I am very much looking forward to bidding 2005 farewell. It’s had some incredible highs, and some horrific lows, and it has made me feel tired and old. I actually think I have some bona-fide wrinkles now! Anyway, the New Year will herald a new… well, year. A new start. Time to get focused, get the last bit of childishness out of me and be happy. Looking forward to it.